Your wedding day is a few months away, but you have yet to purchase your suit, let alone even look at one. Then you think, “Why not just rent one? I’ll only wear it once.” This is a common thought among many grooms. Buying a custom suit may seem expensive, especially if you only plan to wear it on your wedding day. So why not just rent one? You aren’t picky about your clothes, you just want something that fits pretty well. But what about the next time you need a suit last minute and have to rush out and pick one that is ill-fitting? You will wish you had purchased a custom suit. Below we will go through some of the pros and cons of whether to buy a custom suit or rent one, so you can see which option is right for you. The major argument for rental suits is cost. If you know you will only wear it once, and there is no way you will need a suit again, then it makes sense to rent. There may be fit issues, as rental suits are not custom tailored. And the options may not include exactly what you wanted. So you will be forced to compromise on fit and look. Another issue is knowing someone else wore that suit before you, and another person, and another person. But if you don’t mind these issues, then head to the rental shop! Every guy should have a custom tailored suit. Yes, they may seem expensive, but the value you get from a custom suit outweighs the costs. If you work in an office, own a business, plan to have a wedding, or go to any special events, then a custom suit will work for you. Getting your suit customized means a perfect fit, as well as exactly the color, fabric, and shape you envision. Don’t think about the one time cost of the suit, think about it’s value over time. Going to meet a new client with your custom suit will leave a lasting impression that you care about how you present yourself, and your client will take notice. You may have heard of the term bespoke to refer to men’s suits, but do you know its origin? The term bespoke comes from the word bespeak which means “to speak for something”. It now has a special meaning “to give order for it to be made”. Bespoke clothing is the opposite of off-the-rack clothing which you purchase in a store. The term first popped up on Savile Row, which is the epicenter of bespoke clothing. 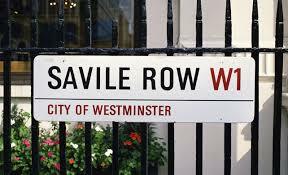 Savile Row is a street in London often called the “Golden mile of tailoring”. This street was built around 1731. During the late 18th century tailors started taking up shop on the road. Tailors still occupy these streets today charging from 2000 to over 3000 British pounds. The street has started to feature ready-to-wear clothes to appeal to those unable or unwilling to pay for expensive, custom suits. By the 1990s, many of the tailors were struggling to find clients in a world where fashion was easy to buy from a store shelf. Three tailors revitalized the bespoke style for these modern shoppers. The three tailors were featured in Vanity Fair and publicity around bespoke grew. There is a gray area between ready-to-wear and bespoke: made-to-measure. These types of outfits are made when the tailor alters the standard-sized pattern to better fit the customer. Fittings are needed for both bespoke and made-to-measure. Handmade was often the distinctive factor of bespoke but now many made-to-measure garments feature a personal touch. If you ever happen to travel to London, put Savile Row on your list of must sees. The history of bespoke started there and continues on after centuries. 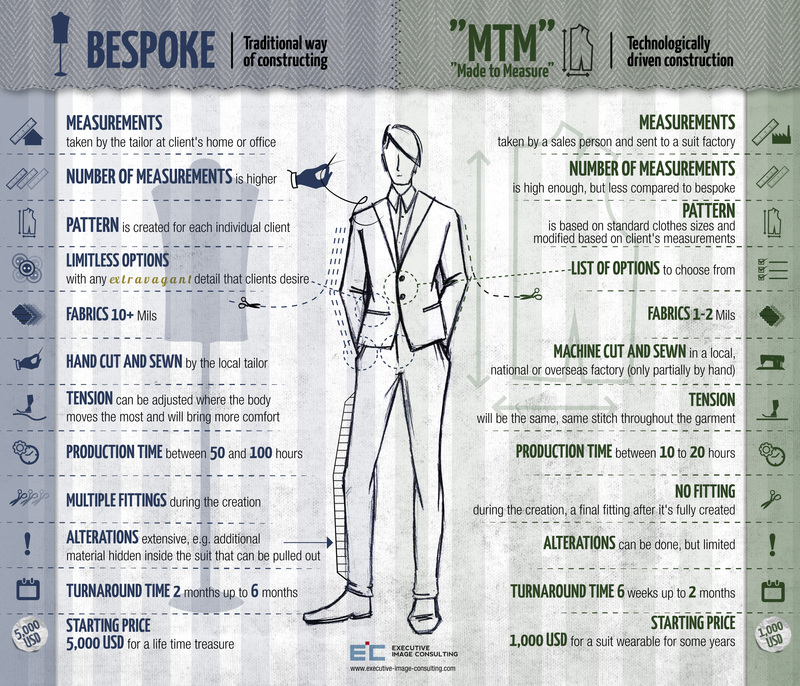 This infographic from Executive Image Consulting provides a great cheat sheet about the differences of bespoke and made-to-measure outfits. Bespoke refers to custom men’s suits, often handmade, and generally quite expensive. 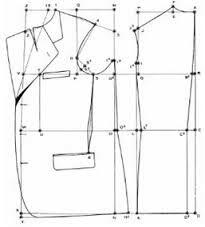 Made-to-measure is not quite bespoke but also not ready-to-wear (outfits you buy pre-made, such as in a store). Made-to-measure garments feature some amount of tailoring and personalization, though not nearly the amount of bespoke. Bespoke offers almost limitless options for customization, which is why the prices can get very high. If you are looking for something custom, but a little less pricey, then made-to-measure offers customization up to a point. Learn more about the differences and similarities to these two tailoring methods from the infographic. 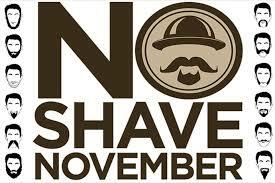 Have you participated in the annual “No Shave November” event? It takes place each November, most likely thanks to alliteration, and requires participants to do just one thing: not shave the whole month. It is open to both men and women, though it is likely more geared towards men. Learn about the origins of this interesting event. No Shave November started as a Cancer fundraising idea by two friends in 2009. The idea was to have people forgo shaving and instead donate the money they would have spent on grooming. The idea is also to embrace our hair, which many Cancer patients lose during treatment. It started as a Facebook page with only 50 participants. The event grew in popularity and in 2013 the American Cancer Society partnered with No Shave November to raise even more funds and promote Cancer awareness. They are now a web-based, non-profit with a large fanbase. It’s easy! Grow your hair freely during the month of November. Donate the money you would spend on grooming to help the fight against cancer. You can sign up solo or as a team on their site (http://www.no-shave.org/#!get-involved/clse). You can also donate straight to the American Cancer Society or purchase No-Shave November gear with proceeds going to the ACS. There are shirts, hoodies, and bracelets. Use the hashtag #LetItGrow to show your support on social media sites. Joseph Wendt is a big supporter of dozens of charities in SWFL, but his generosity goes beyond the Sunshine State. 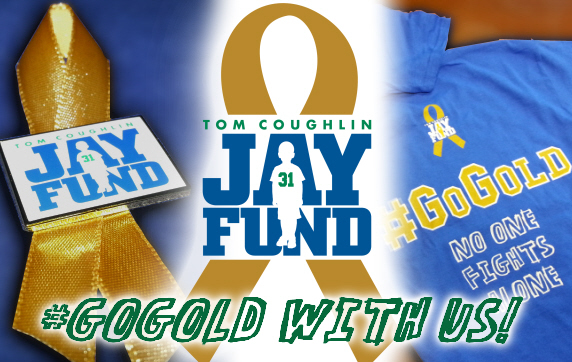 One of the many charities close to Joseph Wendt’s heart is The Tom Coughlin Jay Fund. The mission is to help families tackle childhood cancer by providing comprehensive financial, emotional and practical support. From diagnosis to recovery and beyond, The Tom Coughlin Jay Fund is part of the team, allowing parents to solely focus on their child’s well being. 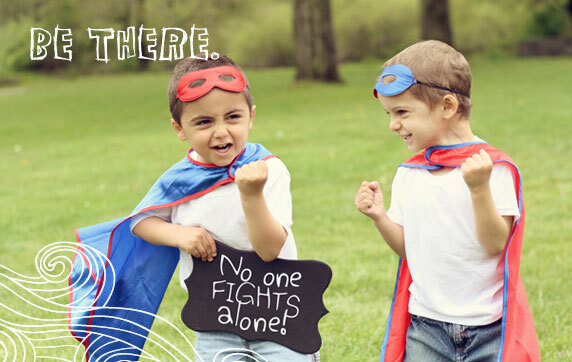 Their goal is to BE THERE for parents facing the unthinkable so they can be there for their families. Next weekend, Joseph Wendt will be donating several items to the silent auction at the 10th Annual Tom Coughlin Jay Fund Champions for Children Gala, set to take place on October 17th in New York City. This star-studded event has quickly become the premier fundraising event for the Jay Fund in the New York/New Jersey area, and this year promises to be the best ever! Be part of the Giants team! With the holidays just around the corner how about the gift of a lifetime! Travel with the NY Giants to Jacksonville as they battle it out with the Jacksonville Jaguars Nov.30, 2014. You and a guest will be treated as a member of the team! Receive car service from your NY/NJ metro area home to the Quest Diagnostics Training Center. Travel with the team in their chartered plane. Stay in the team hotel, head to Everbank Field with the Giants to watch pre-game warm ups ON FIELD. Enjoy the game from great seats, and return travel with the team, hopefully celebrating! Look your best on the trip with a $1200 his/her Gift Certificate from Joseph Wendt Custom Clothier’s ready to wear line; $600 for him and $600 for her. LIVE! with Kelly and Michael: 4 VIP Tickets to see a taping of Live! with Kelly and Michael. Tickets include VIP Seating and backstage access to take photos and chat with Michael after the show! Look your best at the show with a $1200 his/her Gift Certificate from Joseph Wendt Custom Clothier’s ready to wear line; $600 for him and $600 for her. Premium Custom Suit by, Joseph Wendt Custom Clothiers: You’ll receive a hand-made custom 2-piece suit with your choice of fabric and style; includes tailored shirt and tie. Joseph will come to you and personally help choose the fabric to best suit your personality and style. Joseph has fashioned clothing for Tom Coughlin, Michael Strahan and over 100 players in the NFL and Major League Baseball as well as business executives and entrepreneurs across the country. — let alone the world — could be wearing. I have earned a loyal following among business leaders, executives and major NFL players whose sheer size can create additional measurement challenges. All of them realize the benefits of having their clothes custom-made. So why custom? Naples is a small town and you don’t want to run into anyone else with the same suit, which is why I only make one suit with each fabric. If you buy a Joseph Wendt custom suit, you won’t see it on anyone else! I think a lot of men don’t realize the tremendous power of dressing well and being unique. It’s an absolute advantage when you utilize it. I have always said, clothing is psychology. It’s a visual psychology versus a verbal psychology, but it’s totally psychology. Plus, fit is so important, and it’s hard to get that with a department store suit. It’s so difficult to get that perfect fit with a suit you buy off the rack. That’s another reason, custom is key. I understand that young guys just starting out need a bunch of suits and maybe have to go to Men’s Wearhouse or a department store. If you do have to buy off the rack, make sure you spend time to have it properly tailored. Joseph Wendt Custom Clothier now offers tailoring services at our Fifth Avenue South store. Tailoring services are available during business hours to assist customers with altering suits and dress shirts, resizing and hemming pants, re-lining jackets or pants, special occasion dresses and more. Customers are asked to call ahead for an appointment, but walk-ins will be accepted. Call (239) 530-0070 to make a reservation, or visit our Fifth Avenue South store, located in Downtown Naples, Florida. If you have “sartorialness” in your blood, you can probably thank your dad, grandpa, your favorite uncle and all those important men in your life. After all, we all know, eventually what we follow are the actions of our father, not his advice! This Father’s Day, remember to thank dad for always leaving the house looking like the respectable man you now are. 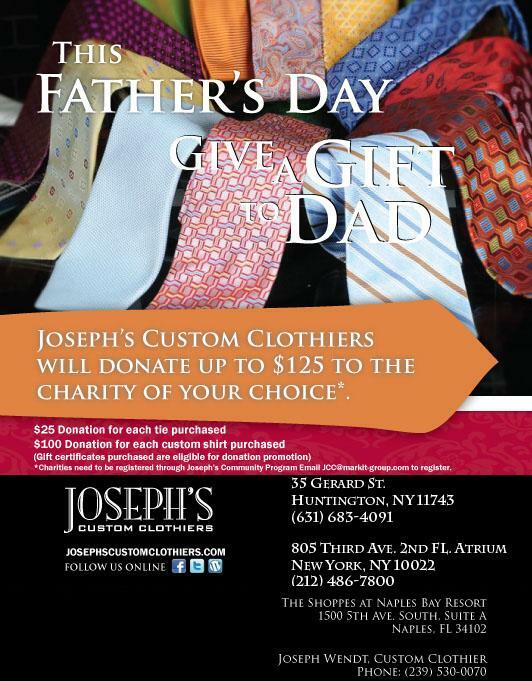 For those of you with a dad of impeccable taste, the gift of custom clothes is always the perfect choice! To magnify the experience, think of something that can make it even more memorable, like a jacket with the colors of his favorite football team, or get sappy and add a know to a custom shirt that reads “so that I’m always close to your heart” (this last one will earn you major points if you have been playing black sheep for a while). Now, we know we all have different dads, so here are some gift ideas for some of the most difficult-to-buy-for of them! Happy Father’s Day! Dinner’s ready! 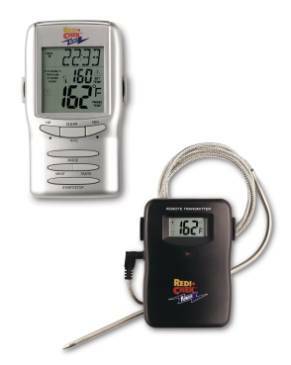 Know when your meats are perfectly cooked with this remote-controlled thermometer. Its wireless transmitter works from up to 100 feet away, so he can mingle and enjoy the cookout, too! 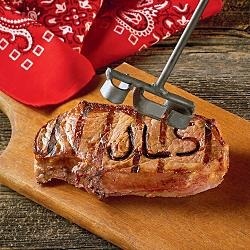 This stainless steel branding iron is the perfect finishing touch for a steak “well done.” Just place the face of the iron on hot coals and brand a steak minutes before serving. The iron is personalized with any three initials. Cloud 9 Living offers 1,700+ adventure gifts. With experiences ranging from rock climbing, whitewater rafting and mountain biking to stock car racing, hang gliding and scenic helicopter and plane tours. What a mess, 500 tees everywhere. Good to see my four-dozen Pro V1s rolling around! Whoops, there’s only one shoe back here… And where is my sunblock?! Ever roll into the parking lot with this scene unfolding? 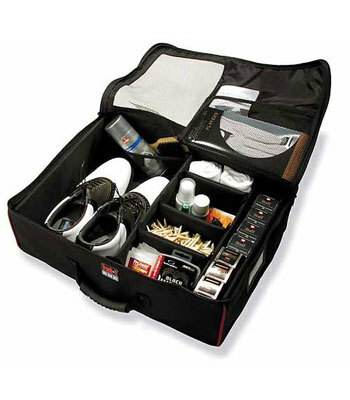 This beauty can easily organize this messy situation. 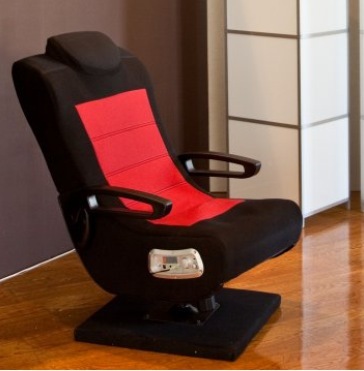 Sit comfortably for hours playing your favorite video games on the X Cooper Wireless Game Chair. The chair’s design lets you tilt and swivel as you play, and because it’s wireless, you can move it into a position for optimal viewing. This durable vinyl chair features armrests that fold up for convenience, and speakers inside the chair to give you the full sensory experience. 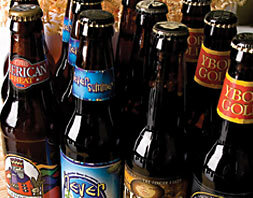 Gift recipients receive 12 bottles of premium microbrews (4 different kinds) every month from award-winning breweries nationwide. Did someone say “game day”? No worries, add to his collection, then! 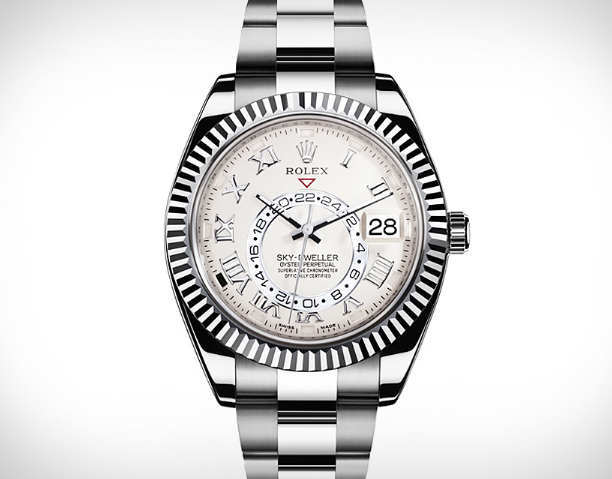 The Rolex Sky-Dweller Watch should do the trick. This unique timepiece features an inner ring that keeps track of the time at home, with traditional hour, minute, and second hands for local time, an advanced date function that knows the difference between 30 and 31-day months, and a ring command bezel that lets you quickly and easily choose.